Corydon's history dates to the American Revolution, when the area was captured by George Rogers Clark from the British, bringing it under the control of the fledgling United States. In the early 1800s Edward Smith brought his family to settle the edge of a fertile valley near a large spring, the site of the present-day county fairgrounds. William Henry Harrison, Governor of the Indiana Territory, often stopped to rest at their home while travelling to and from Vincennes. Harrison chanced on the spot where Big Indian Creek and Little Indian Creek join to become the Indian Creek. Tradition says he decided to build a town there and asked Edward Smith's daughter, Jenny, to name it. She chose the name Corydon from Harrison's favorite hymn, the Pastoral Elegy. Old Capitol Building in downtown CorydonHarrison sold the town site to Harvey Heth in 1808, a government surveyor and large landowner. The official founding date of 1808 commemorates when Heth platted the town. Heth donated the town square for public use, and sold individual lots to settlers and the territorial government. In 1809 Corydon was connected by road to Doup's Ferry, fifteen miles (24 km) to the south in Mauck's Port, providing access to the Ohio River for trade. Corydon sent a mounted militia company nicknamed the Yellow Jackets to support the territorial army in the War of 1812. They fought in the Battle of Tippecanoe, suffering higher casualties than any other unit engaged on there. In 1811 Dennis Pennington began construction on the first state capitol, with the intent of using it as an assembly building for the territorial legislature. Pennington, a Corydon resident, was the speaker of the territorial legislature. Corydon was competing with Madison and Jeffersonville to become the new capital of the territory. Construction, using limestone from a nearby quarry, was built starting in 1811 and was completed in 1815. The Governor's Mansion and First State Office Building were built in 1817. The home of Colonel Thomas Posey was also built during this time. Colonel Posey was the son of Thomas Posey, Governor of Indiana Territory from 1813 until 1816. The Grand Masonic Lodge, the first in the state, was built in 1819. 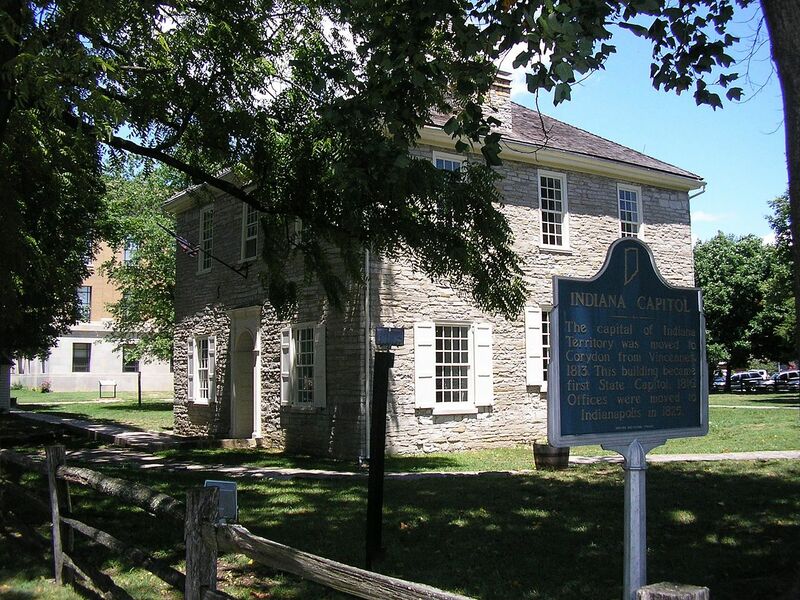 Corydon became the second capital of the Indiana Territory on May 1, 1813, when it was moved there from Vincennes to be more centralized with the population of the newly reorganized Indiana Territory. After statehood, Corydon served as the first state capital of Indiana. During the eleven years that Corydon served as a capital it was the center of politics in the state, and its residents included Davis Floyd, Governors of Indiana Jonathan Jennings and Ratliff Boon(the first and second, respectively), first Speaker of the Senate Dennis Pennington, and William Hendricks, who was the first Congressman, third governor and Senator. Dennis Pennington and other representatives from Harrison County in the Indiana General Assembly resisted attempts to move the capital from Corydon; they succeeded in part by adding a clause to the state constitution during the convention preventing the capital from leaving the town before 1825. Ultimately, as the population center of the state shifted northward, it was no longer convenient to have the state capital at the southern extremity of the state. The capital was finally moved to Indianapolis on January 10, 1825. As of the census of 2010, there were 3,122 people, 1,341 households, and 716 families residing in the town. The population density was 1,892.1 inhabitants per square mile (730.5/km2). There were 1,491 housing units at an average density of 903.6 per square mile (348.9/km2). The racial makeup of the town was 96.7% White, 0.7% African American, 0.2% Native American, 0.2% Asian, 0.1% Pacific Islander, 0.9% from other races, and 1.2% from two or more races. Hispanic or Latino of any race were 2.6% of the population. There were 1,341 households of which 26.2% had children under the age of 18 living with them, 35.6% were married couples living together, 11.9% had a female householder with no husband present, 5.9% had a male householder with no wife present, and 46.6% were non-families. 41.6% of all households were made up of individuals and 20.5% had someone living alone who was 65 years of age or older. The average household size was 2.14 and the average family size was 2.88. The median age in the town was 40.8 years. 20.5% of residents were under the age of 18; 8.7% were between the ages of 18 and 24; 24.9% were from 25 to 44; 22.4% were from 45 to 64; and 23.4% were 65 years of age or older. The gender makeup of the town was 45.6% male and 54.4% female.